Almost every beginning artist starts out as an opening band for someone else. It’s a rite of passage, a way of proving to the world that you can handle being on stage and playing to a crowd, before you can graduate to a headlining spot. But it’s no small accomplishment, some bands will spend their entire lives in this phase, and without embarrassment. Opening spots are relatively easy to find, and can pay well while ensuring you are in front of an awesome crowd and playing with artists you like. Opening bands are charged with a few important tasks. First, they do A LOT of promotion before a show. 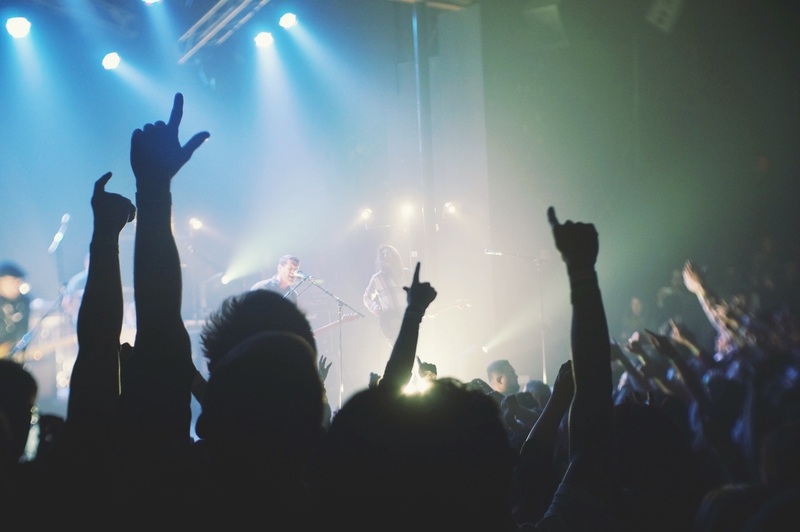 National headlining acts will hire bands they know draw a crowd to market the show and bring people, especially in cities they haven’t traveled to many times. They should get the crowd interested, even if people are still arriving and it’s a bit awkward. Another bit of etiquette here, NEVER leave after your set! If it’s a small crowd, an extra four or five people in the crowd that really like the music can make a big difference. So how should you find one of these coveted spots? First, make sure your basic marketing is in order, nobody will hire you otherwise. You should at least have a Facebook page with some photos and a song on it, and the ability to play a 30min-1hr set no problem. When you do want to start looking, keep it local. Usually, your first gigs are going to be booked through bands you know that live in your area. Don’t be afraid to email or message these bands and ask about opening slots, especially if you see an announcement for a show that you like. I also wouldn’t expect to get paid your first time around, but it never hurts to ask when the show is over. When you do book one of these shows, give out a business card to the venue owners, booking agents, sound guy, or whoever seems interested, and tell them you want to come back and play again. Once you’ve played out a few times and you have some traction online, you can start asking around to book shows for yourself. Again, make sure your marketing is in order before you begin. Video of your live shows will show venues what your live set is like, how much energy you have, and how you handle a crowd. You should have good photos so they can make a flyer, and enough fans to draw interest. Booking shows for yourself is not magic, it simply requires emailing, calling, or visiting venues and asking if they have open nights for you to play. The number one thing venue owners or agents will ask is “How many people will come to your show?” Know the answer to that question, and don’t ever lie about it. Your best bet is to email personal contacts that you’ve made as an opener. Ask for references from bands you’ve played with if you don’t have any. If you need to contact a venue with no personal relationship, do some research. In your email, mention a recent show you’ve been to there, or a similar band that plays there a lot. Don’t just write the same boring email to each place, and don’t ever contact multiple venues in one email. This screams laziness and disinterest. Be prepared to be denied several times in this process. Many venues get dozens of requests a week from bands, they can’t hire them all or even reply in some cases. Don’t be offended. All you can do is keep playing out as an opener and growing your fanbase. You can try asking again in a month or two, but don’t be pushy, and don’t send the same email again, tell them what awesome things you’ve done recently and make your case for why you’d be good for them. Remember, venues don’t care about how good you are, or how many plays your SoundCloud page has, they care about how many people you will bring to your show. If you’ve been at it a while, and have a lot of good shows under your belt, it may be time to get help for the booking process. How will you know when you are ready? You should be regularly selling out small shows or bringing 100+ people to events in your hometown. Agents are an investment, they take money for getting you shows, which is not ideal for every band. They are spending their own time and money to look for gigs for you, so it has to be worth it for them as well. Bookers will open up new leads and communication for you, and can present your act in the best light, but they can’t build your fanbase or start getting shows that you are not ready for. Look for an agent only when the time it takes booking shows begins to take away from the money you could earn doing other things. Many of the same advice I gave above for reaching out to venues applies to finding an agent. You need to impress them, and convince them that you are worthy of the shows they offer. You can find agents in your area with a simple Google search, or through a venue contact. But more often than not, if you are ready for an agent, they will find you. Local agents pay close attention to the gigs in their regions, and make note of young artists who are making waves. The most important thing to understand about shows is that good shows lead to more good shows, and this happens naturally if you focus on your marketing materials and have growing fanbase. It’s crucial to note that the steps outlined here do not necessarily mean that you are “climbing up the ladder.” Some of the biggest bands never hire an agent, they book international tours using their own contacts, and keep all of that money for themselves. And some of the coolest acts hold the title of “hometown heroes”, and play as openers driving traffic for the famous groups that come to their area. Every band is different, as is their definition of success and their path to it. Have any good tips for getting shows? What kind of success have you had with the ideas listed above? Tell your story in a comment below.